Chinese Visa - The ODM Group China Buying Office keeps you updated. Traveling in China is really special, rewarding and increasingly accessible. Full of wonderful sites and attractive cities, China is attracting more and more foreigners each year for work and leisure. However, getting a visa can be sometimes difficult and you have to carefully plan on getting the right Chinese visa before travelling. Most clients from ODM will visit factories in China for no more than 2-3 weeks at a time and usually they will apply for short term (3-6 month) single or multiple entry visas into China. This takes anywhere from 2-5 days (pay more for express service). Usually we apply with agents like China Travel Service Visa Section. 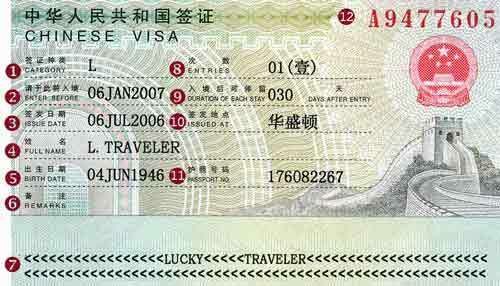 Visa L: Tourist Visa allows you to stay up to 90 days in China. You have the possibility to renew it for one more month 2 times from inside China. Justification documents to provide to the embassy: Return flight tickets, hotel booking justification or invitation letter from a friend. Visa F: Business Visa is issued to an alien who is invited to China for a visit, to conduct an investigation, to lecture, to do business, scientific-technological and culture exchanges, short-term advanced studies or internship for a period of no more than six months. This kind of Visa is getting more and more difficult to obtain due to the demands. Visa X: Student Visa long duration for students staying more than 6 months in China. It is a temporary residence permit usually obtained on location. Justification documents to provide to the embassy: University documents (admission certs), physical and health examination. Visa Z: Professional Visa for workers. Usually the company will guide you and help you to apply for this Visa. Justification documents: Company certificate, physical and health examination. Some Chinese Visas require the applicant to exit China after a certain duration (written on the Visa). About the entry and exit of territory allowance it varies according to the visa and the price you paid to get it. For most people, Hong Kong is probably the best place to go to activate visas from China – most people do not need to apply a visa to get into HK and get automatic 3 month visas. Great care must be taken when applying for visas from China though. For example, applying for an F business visa for a German or French staff in Shanghai office would be different – the German staff can activate the visa by simply visiting Hong Kong. Today the same person holding French passport needs to return to France. ODM recommend clients to contact the chinese embassy in their country in order to make sure visas can be applied early.